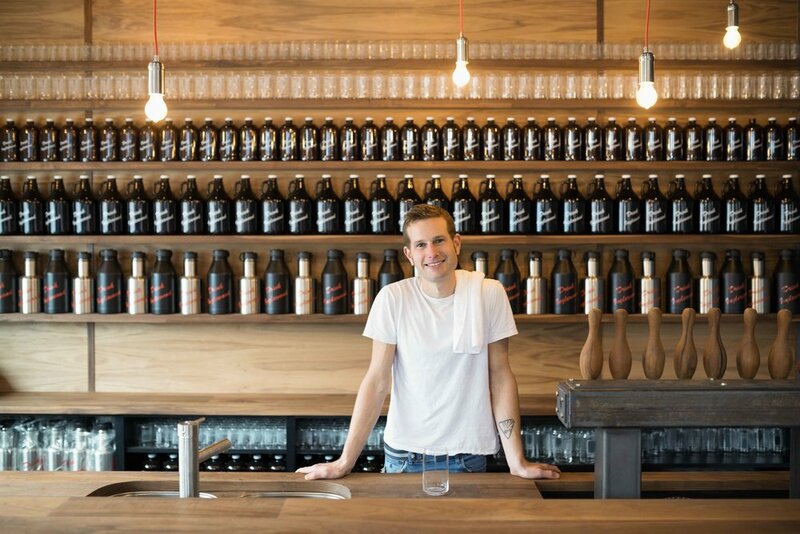 High Line Brewing is a small batch craft brewery based in Calgary. HLB opened in November 2016 and is located in the historic neighbourhood of Inglewood. Since then, Head Brewer JJ Mathison has been creating both high quality classic styles and exciting new flavours such as hazy IPAs and hopped sours. There is always something new in the tank. Open for growlers fills, bottles and cans to go, and gathering with friends, our intimate 30-seat tap room with room at the bar, offers an always-changing selection of quality beer. In warm weather, enjoy one of our sought-after patio seats while sampling one or all of the twelve beers on tap. #113, 1318 9th AVENUE S.E. Brewed due to popular demand for an easy drinking, simple ale. This pale ale is true to style, not too hoppy, and clean and crisp for the summer heat. Refreshingly tart, slightly bitter, the black currants add complexity and depth to the resinous flavours of the hops. Cold Dry Canadian Winter. Dark, dry and sessional. Need we say more? An alternative to cider, this fermented tea delivers notes of grapefruit and benefits from dry-hop additions. Perfect for those who prefer to be gluten-free. 12 hours of lactobacillus and a healthy dose of hops have made this a regular at HLB! Showcasing the herbal and bitter notes of British hops vs. fruit/citrus of American hops, this ale is inspired and named after our friends at Kent of Inglewood. This full bodied Imperial Stout is brewed with 3 types of chilis and cocoa in the boil. Lactose post fermetation provides body and a Haberno tincture is available to add “danger” in the form of spice! Visit Vermont in Calgary. A hazy, juicy New England DIPA, brewed with the addition of wheat malt, Conan yeast from Vermont and dry hopped with citrus/tropical forward hops. Our take on a Scotch Ale. Well rounded with a hint of smoked malt. A refreshing sessional sour with that delicious yuzu taste. Another Barrel-Aged version of an HLB classic. Close to two months in a barrel has added depth and sweet oak flavours. Dry-hopped post-barrel. Six weeks in a Cabernet Sauvignon barrel have enhanced the funky flavours of French Saison yeast while adding depth with oak and tannins. Scotch Ale aged for 6 weeks in a freshly-emptied premium Alberta whiskey barrel which has enhanced the deep, sweet, velvety finish of one of our classics. COLD BREW - NITRO SOUR - 3.5% - A nitrogenated session stout, infused with Big Mountain coffee and lightly soured in the kettle. INGLEWOOD - IPA - 6% - Our IPA with a west coast focus. This single IPA benefits from the resinous and spicy character of west coast hops. KENT - ESB - 5% - Showcasing the herbal and bitter notes of British hops vs. fruit/citrus of American hops, this ale is inspired and named after our friends at Kent of Inglewood. WHISKEY BAREL-AGED SOUR - 6.5% - Introducing the third beer our new HLB Barrel Aged series. We took a blended session sour and gave it size weeks in a freshly emptied whiskey barrel. Evocative of a young white wine, it is mildly sour with brightly fruity aromas and overtones with the slightest hint of oak and zing from the whiskey barrel at the finish. YMPA - PALE ALE - 5% - A medium bodied pale ale steeped with Yerba Maté tea and lightly dry-hopped with a blend of hops and a bit more Yerba Maté. MERCHANT - SAISON - 6% - A small batch spiced saison with cardamom and a slightly sour finish. HIGHPA - DIPA - 8% - Our East Coast style, full bodied, heavy hitting, dry-hopped Double IPA. DADGE - PALE ALE - 5% - Nothing says cool like cucumber. Beat the summer heat with our cucumber infused pale ale. DIYPA - ISA - 4.4% - Featuring Citra, Mosaic and El Dorado dry hop additions for big fruity hop aromas in a crisp sessional 4.4% pale. Will you fill growlers from other breweries? Yup! As long it's clean, we will fill it. Yes, accompanied minors are welcome. There are 3 kiddos in the HLB family, so we make sure to always have juice, snacks & distractions at the ready! We have snacks available for $1, but, unfortunately, no space for a kitchen. Outside food is welcome and Without Papers Pizza is always happy to deliver for free. Do you book private events or tours? Unfortunately, we don't accept reservations. We have a small tap room with 30 seats but we're licensed for 35 (with more room on the patio in the summer) so there's usually space at the bar for tastings while you wait for a table. What about filtering your beer? All of our beers are unpasteurized and unfiltered so keep it cold and drink it fresh. Everything happens on site in the brew space behind the tap room.